Last Friday, Hafiz Ringim, Nigeria's Inspector General of Police stated that Nigerians should not use cameras or mobile phones to document events during the upcoming elections. We are glad that the Independent Electoral Commission has stated that ''the use of mobile phones/devices are allowed at various polling units across the nation during the 2011 General Elections'' but wish to note that the IGP's order goes against international best practice- which is why citizens and CSOs have denounced the order. It is against this backdrop that EiE Nigeria is launching ReVoDa, a new mobile application designed to allow citizens report incidents, results, violence/fraud,police behaviour,INEC staff conduct etc from their respective polling units- and from the comfort of their mobile phones. ReVoDa turns eligible voters into informal election observers, and allows monitoring organizations to draw conclusions about the legitimacy and accuracy of the elections. ReVoDa provides untrained citizens with a medium through which they can share their objective and subjective election experiences and it potentially turns the 87,29,789 Nigerians with mobile phones, 43,982,200 with internet access and 2,985,680 on Facebook into informal election observers. ReVoDa is easy to use and comes with a HELP function to guide you. Anyone can download ReVoDa by texting the word GO to 0812 888 2011. 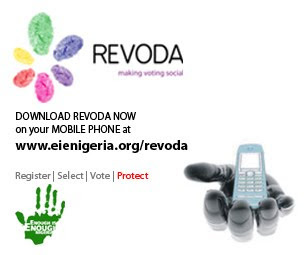 ReVoDa, as part of EiE Nigeria's RSVP campaign, connects voters to the entire process and makes it fun- especially for young voters who are avid technology users. The Nigerian Communications Commission will be required to be at its alert best as the watchdog of the Telecommunications sector. Citizen monitoring and reporting of the elections will take place mainly via text messages and the internet. Fears of sabotage of the process by these companies under the influence of the political class have been raised by many Nigerians. EiE expects the Nigerian Communications to step up to the plate and ensure that this does not happen. EnoughisEnough Nigeria (www.eienigeria.org) is a coalition of individuals and youth-led organizations committed to instituting a culture of good governance and public accountability in Nigeria through advocacy, activism and the mobolization of the youth population as responsible citizens. The coalition includes The Future Project, Light Up Nigeria, Paradigm Initiative Nigeria, Education as a Vaccine (EVA) and Kudirat Initiative for Democracy (KIND). EiE Nigeria has created the RSVP CRegister|Select|Vote|Protect) campaign to leverage technology, especially social media to mobilize significant participation from citizens in the 18-35 age bloc in the 2011 elections.